The Furman Libraries welcome visitors, guests, and community members during regular business hours. Available services for visitors include: use of space, use of wireless Internet, use of resources on-site, and for library card holders, checking out materials. Visitors may also use computers during low-demand times in the semester, but they must receive a Guest Account at the IT Service Center (located in the Duke Library) in order to access the computers. Visitor parking is available in several lots on campus. See the map below for visitor parking and handicapped accessible parking near all the Libraries. If you have difficulty accessing the campus, please use this form to Report an Accessibility Barrier. Park in one of the handicapped parking spaces near Hipp Hall (see map). Enter the lower level of Hipp Hall through the door (to the right of the handicapped parking spaces) and follow the hallway to the end to reach the elevator. Exit the elevator and to your immediate right is an exit from the building. 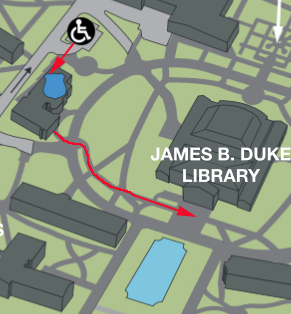 Once outside, the Duke Library will be the building directly in front of you. If you parked in one of the Chapel Lots, the Chapel has a single-seat electric mobility scooter available for loan. This is a free service offered to students, faculty, staff, and visitors with a permanent or temporary mobility impairment. Please call 864-294-2133 to make a reservation or check availability. Please enter the lower level of the Chapel to borrow the scooter. You must sign the release of liability. A photocopy of borrower’s driver’s license will be made and kept in an electronic file. There is no time limit for use, but the scooter must be returned by 4:00pm during regular business hours. While in service, the shuttle makes stops every 15 minutes at the following locations: The Chapel, the Physical Activity Center (PAC), the Duke Library, the Dining Hall, and Building J of North Village. 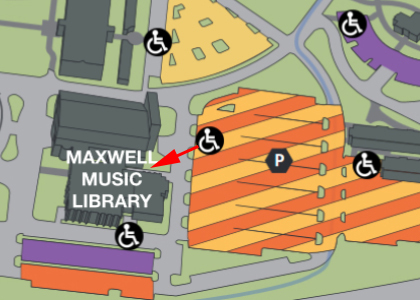 If you have limited mobility and a handicapped permit, there are several close parking options for accessing the Maxwell Music Library. We recommend parking in the lot directly behind McAlister Auditorium and entering the Herring Music Pavilion. The Maxwell Music Library is located inside the Pavilion. Park in the South Chapel Parking Lot in one of the handicapped spaces nearest to the crosswalk. Using the crosswalk, cross over the Furman Mall and enter Plyler Hall. 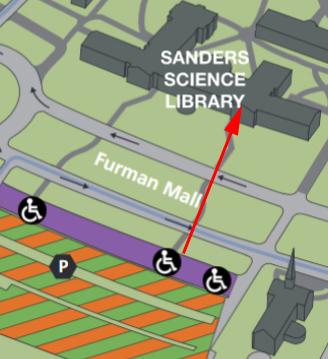 The Sanders Science Library is located inside Plyler Hall. If this walk proves challenging, we recommend borrowing the mobility scooter.